Manufacturers now offer plenty of choice when it comes to self-propelled foragers, but what size is best to cover the hectares, one large machine or two smaller ones? Jane Carley gets contractors views. Contractors are increasingly running large equipment, and the choice of one large or two smaller foraging outfits is a hot topic. For silage contractors, the conundrum of either keeping multiple customers happy, or carry out the work fast with one big outfit has long been a cause for debate. From a customer’s point of view, the former sounds the most potentially appealing, with a contractor having multiple machines to get there when the customer asks. However, contractors would likely argue the opposite, as one large chopping outfit could offer potential cost saving, particularly staff. To find out the reality of the two systems, we talk to advocates of both. Contractors Alyn and Julie Pierce run two Claas Jaguar foragers, with a third machine as a back-up, from their base in Flintshire, North Wales. Mr Pierce who also rears 160 cattle, has been silaging since 1984 and explains that running two foragers, a 585hp Claas Jaguar 870 and 516hp 860, suits his diverse customer base – herd sizes range from 50 to 700 cows. “If you run a larger forager there is always the possibility that a farmer will end up waiting for you – I would rather have two machines and two happy customers! You can have the most powerful machine in the country but you still need to be able to get round the farms in a timely manner,” he explains. 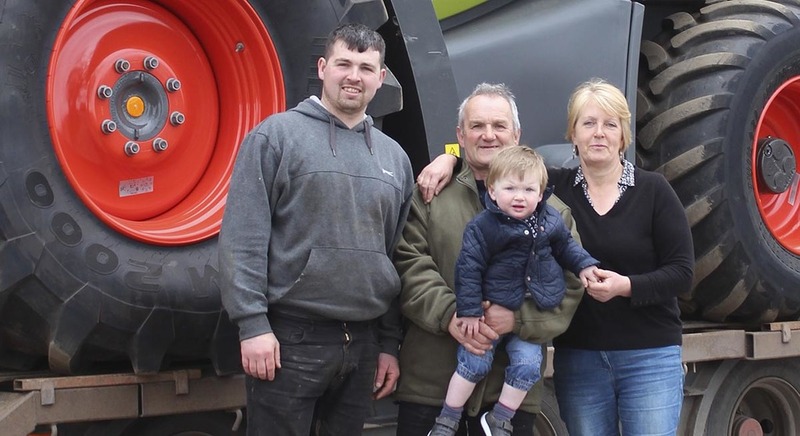 Alyn Pierce (centre) with son Gareth, wife Julie and grandson Thomas, has two Claas Jaguar foragers with a third as back-up. Mr Pierce comments that even when chopping 200ha for his largest customer, the land tends to be in small blocks of 32 or 40ha, with road travel in between, so the Jaguar 870 and 860 work well together for that job. “We will even use all three foragers for the first couple of weeks of the season to get on top of the inevitable backlog,” he adds. 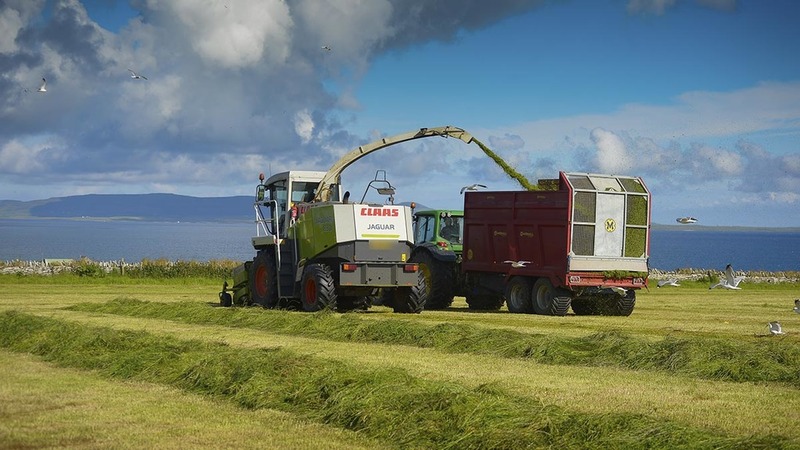 Mr Pierce runs two complete silage outfits, with Claas Disco front and rear combination mowers and twin or four rotor rakes, depending on the size of the job. The total workload comprises 240ha (593 acres) of wholecrop, 350ha (865 acres) of maize and 2800ha (6,920 acres) of grass over three cuts. 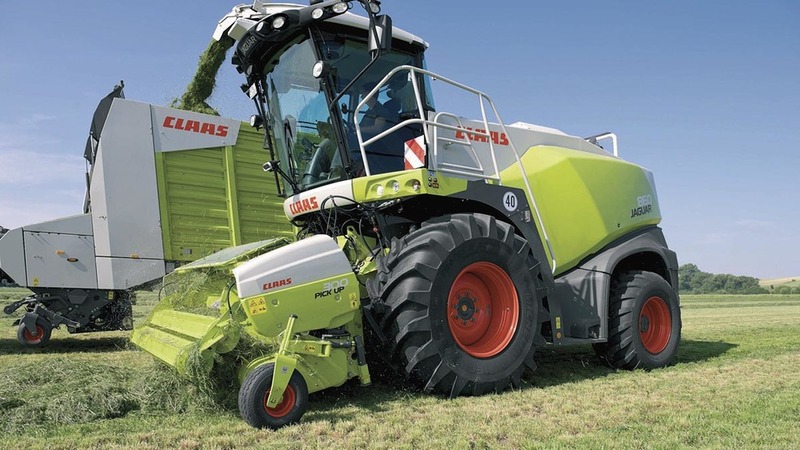 Claas Jaguar 800 series foragers attract strong resale values in Alyn Pierce’s area in North Wales, helping to keep control of whole life costs. He adds that used 800 series Jaguars are also in demand locally, guaranteeing strong resale values. A recent move to purchasing new rather than used machines was prompted by the small price difference for the brand new Jaguar 870 over a two-year old forager, the availability of 0 per cent finance and increased capital allowances. In addition to resale values, good local dealer back-up and support from Claas including updates when any new technology comes along brought him back to the German brand from a competitor’s machines. Mr Pierce has an older Jaguar 830 as a back-up machine, which he can also send out on a forager-only basis. The Jaguar 830 is assured of its continued place in the fleet, as it is used throughout the season to help others who have had breakdowns or just to fill farmers’ own trailers on a forager-only basis. “It is worth about £55,000 and for that money I could not purchase any other machine with the earning potential,” says Mr Pierce. He comments that to run two silaging outfits, it is essential to have the plenty of labour – he has the services of a number of self-employed drivers and the right machine. Drew Graham provides a forage service to dairy and beef farms in central Scotland and also chops for the AD market. Based in Milngavie, East Dunbartonshire, Drew Graham Contracting travels as far north as Wick and south into England when requested. “We harvest 55,000 tonnes per year of rye and ryegrass for AD plant feedstock across 1500-1800ha, as well as 1000ha of grass for beef and dairy farms,” he explains. 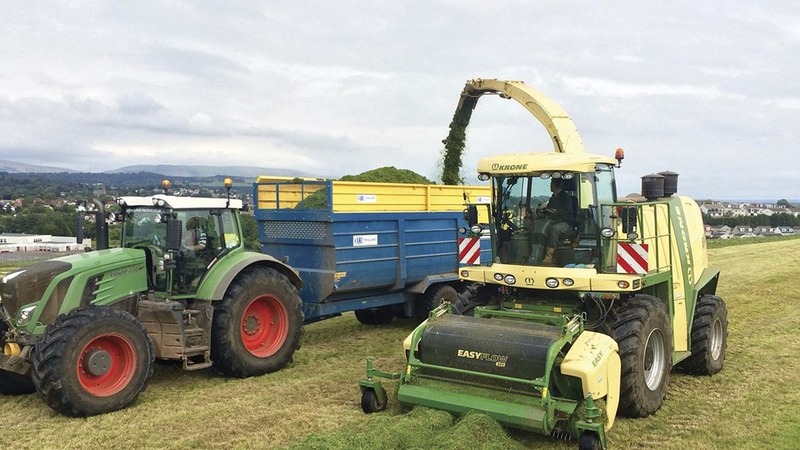 Mr Graham offers a full forage service from drilling to clamping, and operates a Krone Big X 1100 self-propelled forager alongside forage wagons. Powered by a MAN 12-cylinder 1100hp engine, the forager is equipped with a 40-blade Biogas drum. Drew Graham Contracting chops both grass and rye on 2500ha in central Scotland, using an 1100hp Krone Big X 1100. While the forager’s big appetite is very suited to quickly dispatching one job after another, it also has the ability to adapt to lighter crop conditions. Krone’s PowerSplit technology allows two engine settings to be selected depending on crop condition; Eco Power is used in situations which do not require full engine power whereas X Power delivers the engine’s full capacity in difficult conditions. The forager is supported by up to 12 tractors with 16-18 tonne trailers depending on distance from the clamp. Mr Graham is running seven Fendt tractors and one Case Puma for the 2017 season and brings in sub-contractors as and when required. He adds that despite its power, the Big X 1100 is no different to operate to a smaller sized machine. Mr Graham says that the forager has certainly met his expectations in terms of performance and durability and comments that he plans to keep this machine for 10 years or more.